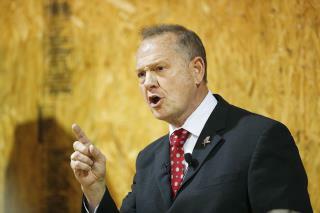 (Newser) – Debbie Wesson Gibson used to have fond memories of the relationship she says she had with Roy Moore when she was 17 and he was 34. Not anymore. The Alabama woman says that in recent comments, Moore effectively called her a liar which made her decide to share a recent find with the Washington Post. Gibson showed the Post a graduation card from Moore, with the handwritten message: "I wanted to give you this card myself. I know that you’ll be a success in anything you do. Roy." Moore admitted to Sean Hannity last month that he had dated Gibson but changed his story last week, telling campaign rallies that he did not know and did not date any of the women who have spoken to the press about him. People still just aren't getting it. A chimpanzee doing lewd things in a cage is better than a liberal democrat.
" I know that you’ll be a success in anything you do. " Sure sounds like a romantic note to me. Next we'll hear he gave her a mop for a birthday present.